Thanks to her migration policy, German Chancellor Angela Merkel is a popular figure in Africa. But her tour to Senegal, Ghana and Nigeria was primarily for her voters back home, says Claus Stäcker. Rarely has African airspace been so full of German government delegations. 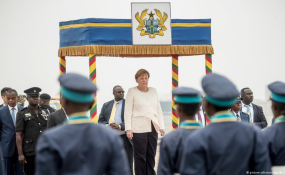 This week, Chancellor Angela Merkel visited Senegal, Ghana and Nigeria. Meanwhile, German Development Minister Gerd Müller hopped between Eritrea, Ethiopia, Mozambique, Botswana, Zimbabwe and Chad. -- and Minister of State Michelle Müntefering stopped by the Foreign Office in Namibia. It seems Africa has become increasingly important to German politics. But the focus of the trips raised more questions than answers. While Müntefering dealt with the extremely sensitive repatriation of the remains of the Herero and Nama peoples from Germany to Windhoek, Müller could relax on the political front as he waved around billions in development funds -- even in Eritrea, Ethiopia and Zimbabwe, where until recently it was still frowned upon. And Chancellor Merkel? She chose her travel destinations carefully. She visited reform partners in Senegal, Ghana and Nigeria, who are not only interesting from an economic point of view, but they are also at the center of the migration debate as countries of origin. This part is critical: While Merkel did not make any trips to the continent between 2012 and 2015, she has been developing a frantic form of travel diplomacy since the beginning of the refugee crisis. Since 2016, she has visited no fewer than nine African countries -- all relevant to migration. Merkel enjoys a good reputation in Africa, mainly due to her historic decision on refugees in 2015 -- for which German voters effectively placed her in the pillory. So her hosts are pleased about the visit, as it plays directly into their campaign plans one way or another. The German media accompanying the tour also got their hoped-for headlines which clarify the connection between investment and migration limitations. So far, so good. But the trip does not solve the Gordian Knot that is Germany's Africa policy. Merkel is rightly promoting German investment. Of the 400,000 German companies operating abroad, just 1,000 are involved in Africa. And if you don't count South Africa, barely 400 companies remain. Only every thousandth German company operates abroad at all -- so when Merkel makes her blatant appeals to the other 999, Africans are delighted. But the chancellor can't please everyone. Only China gets that -- and the Chinese are already everywhere. Above all, last year -- Germany's so-called 'Africa Year' -- generated a large number of position papers, guidelines and cooperation initiatives. The Federal Ministry of Finance wants to create secure investment partnerships alongside the G20 Compact with Africa (CwA) program. The economic minister with the Pro! Africa initiative sharpened the instruments to promote foreign trade and helped Müller save the continent single-handedly with the so-called 'Marshall Plan' for Africa. A few of these measures seem to be taking effect in the meantime. By July, direct investment for 2018 exceeded the previous year by over €1 billion ($1.16 billion). Export credit guarantees -- especially the Hermes cover -- make investing easier. But Germany is exaggerating with these claims. Trade with Africa can only be changed though the European Union (EU). But the EU's threshold for these kinds of trade agreements is quickly approaching -- the Economic Partnership Agreements (EPAs), which Brussels has little to complain about, are overtaxing economies in their current form, according to experts from Africa. The tariffs that Müller demands be abolished are not the obstacle here -- because there is no such thing. The core problem is that there is hardly any finishing industry in Africa, meaning there are less competitive finished products and, therefore, hardly any jobs. Beans, tomatoes and cut flowers still find their way to the EU market. But the few finished products fail -- if not because they already lack power in Africa, then due to the bureaucratic requirements and the necessary certifications. This is where Germany could help. When it comes to dealing with African countries, new policies and papers are not needed -- rather a mental paradigm shift. They are formulating their own interests more clearly than before: from natural resources over security to the prevention of illegal migration. Germany does not have to act like a headteacher, but it should choose its partners based on clearly communicated standards. It should drop its image as a helper-of-sorts and instead act more like a colleague when it comes to dealing with its African partners. Instead of having a hidden Africa Minister in the Development Ministry, alongside competing staff units in three other ministries, there should be one strong coordinator in the Chancellery. A similar model is recommended for Brussels -- because the practice of obstructing refugees on the Mediterranean from entering another country must be linked to perspectives. For example, a coordinated investment and trade program that also examines the still-unbelievably-high European agricultural subsidies. Germany, perceived as a European economic powerhouse, must also remain a reliable partner for fragile democracies and civil societies. If it wants to act credibly, it must also confront its colonial legacy -- as is the case in Namibia. It's a painful process, but one that Germany could have started with in earnest by having the chancellor herself address the issue of compensation in person, rather than sending a junior minister instead.